The first four cars were originally named, Melbourne, Ballarat, Wolseley and Adelaide, but these names were altered to the names of rivers in the two states of SA and Vic, becoming to Loddon, Glenelg, Finniss and Torrens in 1910. In 1911, Onkaparinga and Barwon were built, to be followed by Baderloo, Dargo, Pekina and Tambo in 1919. In 1923, a further four cars were named Angas, Coliban, Acheron and Inman. Each car was 75 foot long, with a steel underframe mounted on 12 wheeled bogies. the wooden bodies had clerestory roofs, vertically boarded sides, and were North American in appearance. Internal layout comprised nine compartments, 6'4" long and 5'3¼" wide, each with two fold up lateral sleeping berths, a folding was basin, cloth hanging cupboards etc. A small smoking saloon at one end of the car in which two more berths could be made up if needed. This was known as the Gentlemen's lounge, and provided with four loose, leather covered, cane arm chairs and a fixed transverse seat for three. The loose chairs were later removed. A single long window was provided for this saloon. 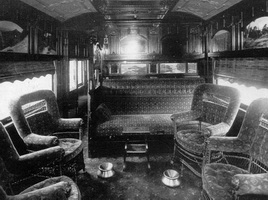 The fixed seat could be converted into two additional berths by curtaining it off from the rest of the smoking saloon. The top berth was hinged above this seat and a standard fare was charged for using this semi-open two berth compartment. Two compartments at the opposite end of the coach to the smoking saloon were reserved for ladies and swing doors in the 51'2" long corridor separated these compartments and the smoking saloon from the rest of the cabins. Access to the cabins was by sliding doors. Conductor's compartment at either end, one of which had tea making facilities and lavatories. Finished in Edwardian style, the carved paneling, pressed metal ceilings, frosted glass and lamp pendants all being ornately decorated. External finish included a row of bevelled mirrors above each window with an engraved star burst pattern. Removed in later years due to maintenance problems. There were 3 above each normal window and 7 above each saloon window. Each door had coloured leadlights in place of plain glass above the window panel. From 1936, they were externally painted dark green with "The Overland" in chrome plated letters on the fascia panel above the windows. From 1943 repainting in Victorian Railways standard Tomato Red colour scheme began. As built, these coaches, (gas lit and screw coupled), weighed 37 ton 7 cwt. and as with the other "E" series coaches the fitting of strengthened underframes, electric lighting and automatic couplings increased the weight of the 1911 built cars to 39 tons 11 cwt., while the later cars weighed in at 41 tons. Passenger capacity was 18 people in 9 compartments. Five of the carriages were transferred to form the "Train of Knowledge" for Victorian Railways in 1965. Between November 1983 and May 1984, these carriages were upgraded. Restoration work included repainting, revarnishing, new upholstery, new carpeting, retention toilets and reinstatement of the original sleeping car names ( Acheron, Coliban, Inman, Pekina and Loddon). In 1926 two Pullman sleepers named Mount Lofty and Macedon where purchased. Further details car be found in Commissioner Webb's Pullman Carriages.